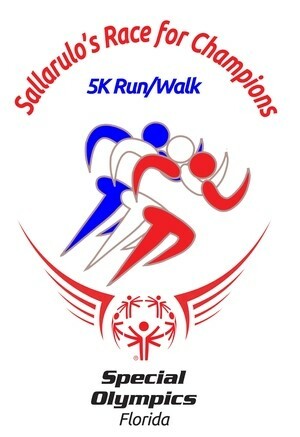 Get out your running – or walking – shoes and sign up for the 13th Annual Sallarulo’s Race for Champions to be held here on our campus on Saturday, November 3rd. Hundreds of runners and walkers will participate in this 5K race to benefit Special Olympics Florida – Broward County. Registration starts at 6:30 a.m. and the run starts at 8:00 a.m. in the circle on Abe Fischler Blvd. ALL Alumni, Faculty, staff and students who sign up to run or walk with the NSU team, will have the $30 per person fee WAIVED. All registered participants will receive a free t-shirt and gift bag. You can also choose to start your own fund raising page to help support Special Olympics. Following the race, an awards ceremony will be held at 9 am. Special Olympics Florida – Broward County’s athletes, their families and all race participants are invited to stay and celebrate at the Carnival of Champions featuring breakfast and lunch, surprise celebrity guests, refreshments and entertainment. Let’s support our own Special Olympic athletes. NSU is the only private university in the country with a local Special Olympics chapter on its campus, now being housed permanently in the NSU University School sports center. In fact, a member of NSU’s Board of Trustees, Paul Sallarulo, serves as Chairman of the Race for Special Olympics Florida – Broward County. NSU’s partnership with this worthy organization is made possible by the late Don Taft, who had been committed to supporting special-needs children and young adults. All proceeds from the race will benefit Special Olympics Florida –Broward County, whose mission is to provide year-round sports trainings and athletic competitions for children and adults with intellectual and developmental disabilities. Registrations is available on line at http://sallarulosraceforchampions.org. To register for the NSU team – just click register here and then on GET STARTED. Make sure you use the code: NSU – to get your free registration.